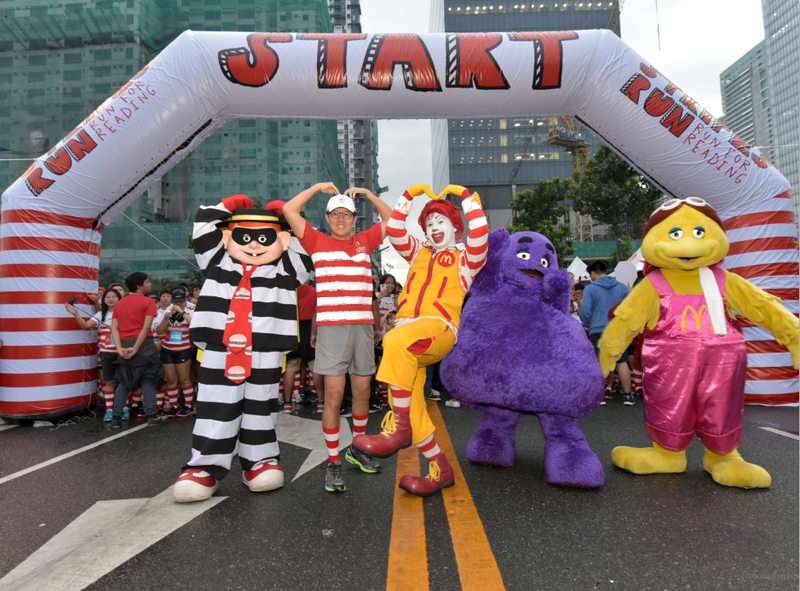 Close to 6,000 runners donned their red and white striped socks as they joined the highly-anticipated McDo Stripes Run: Run for Reading held last November 26 at Bonifacio Global City, Taguig. With every step into the race, the runners helped thousands of Filipino children learn how to read. Proceeds from Stripes Run amounting to Php2 million were was donated to one of Ronald McDonald House Charities’ flagship programs, Ronald McDonald Read To Learn. Since 2002, Read To Learn has helped close to 12 million Grades 1 and 2 public school students all over the country to improve their literacy skills. Kenneth S. Yang (2nd from ledt), McDonald’s Philippine President and CEO, do the M logo sign as he poses with Ronald McDonald (center), McDonald’s Chief Happiness Officer, and the gang composed of Hamburglar, Grimace, and Birdie. 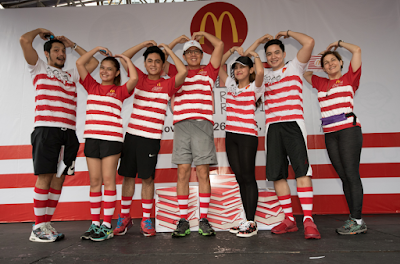 Runners were delighted to see their favorite McDonald’s endorsers such as real life couple Dingdong Dantes and Marian Rivera, and popular loveteams Alden Richards and Maine Mendoza (AlDub), McCoy de Leon and Elisse Joson (McLisse), and Bianca Umali and Miguel Tanfelix (BiGuel) run for reading. They were also joined by McDonald’s ambassadors such as child actor Alonzo Muhlach, UAAP volleyball star Kianna Dy, and MYX VJ Donny Pangilinan. This is the 7th consecutive year for McDonald’s Stripes Run in Manila. For the first time ever, Cebuanos can also join in the fun and support McDonald’s advocacy as Stripes Run will be held in Cebu City on December 3, 2016. McDonald’s recognized the fastest male and female runners per category and awarded them with exciting prizes from sponsors, with cash prizes and gift certificates from McDonald’s.